The original mechanism Papillon is inspired by the flight of monarch butterflies; the most outstanding example of nomadism in the microscopic world. These colorful, tiny specimens propel migration to an extraordinary level each year performing a wonderful journey across the American continent. Just as unique as the route of the monarchs propelled by its wings, the Papillon mechanism bears two independent, retractable, diamond-shaped hands on a supporting disc. Each one alternately sweeps over a graduated minutes scale spread over a 180-degree half circle. The minutes are successively indicated by each of the two hands. The first is positioned on the segment and thus signals the progression of the minutes, while the second one remains ‘off-duty’ in fall-back position and thus invisible throughout the rotation of the disc bearing them. When the first hand reaches the 55th minute on the display segment, the other hand progressively completes a quarter turn to move into a position parallel to the first one on the 00 minutes marker. The first hand then moves into its fall-back position for the following 55 minutes. 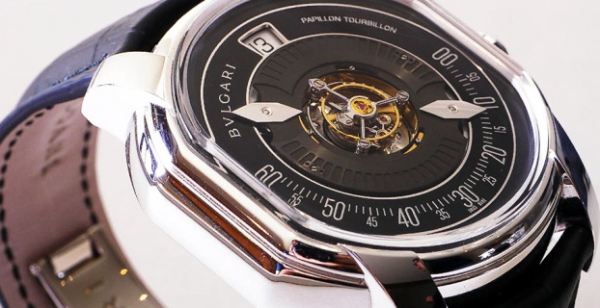 The Papillon system has the advantage of using less power in comparison with the classic minutes indicator and therefore has a positive impact on the power reserve. This patented, complex, exclusive mechanism can naturally be combined with a variety of information and functions. 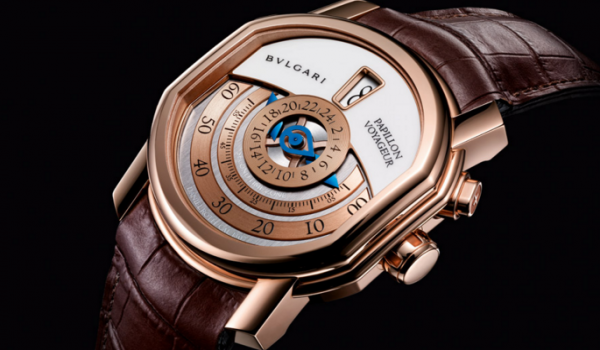 In the case of the simplest display of time, Bulgari Papillon Heure Sautante displays the jumping hour, indicates the minutes via the Papillon device, and shows the seconds by the central hand. 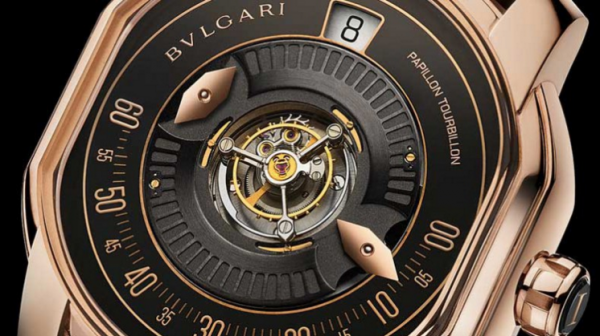 In the Papillon Tourbillon Central watch, the Bulgari watchmaking Manufacture places the tourbillon movement in the very centre of the case of this precious, unique timepiece available in pink gold or platinum, in the same way that a diamond is set in the centre of a piece of jewelry. 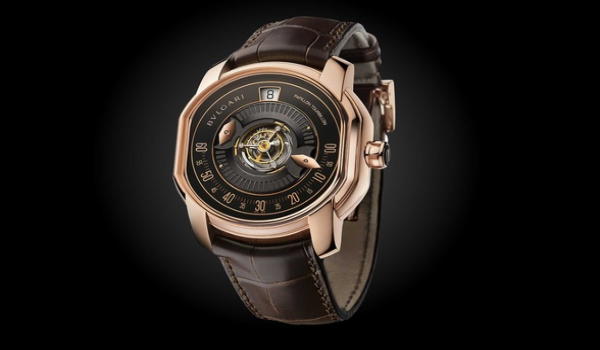 The entire composition stands out by its clean lines, symmetrical axes and the architectural precision of the dial – further demonstrating the mastery of these fundamental elements in the array of contemporary creations by the Maison in the highly competitive spheres of “grand complication” watchmaking. The Papillon Heure Sautante will be a recurring production available in rose gold and white gold; while the Papillon Tourbillon Central will be featured in rose gold and platinum both limited edition pieces.